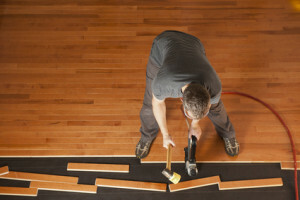 Installation of hardwood floors is made simple by hiring a hardwood floor installer who really knows what he is doing. The trick is to make sure that the guy you hire has experience. They will plan your floor out to make sure that it is done properly and looks great when it’s finished. Knowing a little bit about installing hardwood floors can help you interview the installer. Also make sure that the guy that will do the job for you has experience and will do an excellent job. You should ask for recommendations from the store where you purchase your hardwood. You really want to go beyond just getting a recommendation from the hardwood floor store. Understand the best approach to laying out your flooring. Which direction should the floor run in? Across the joists that support the floor or along a hallway? You might also ask for references and actually go and see the people to look at their floors. Discuss with them what their concerns and issues about their floor are. How it was installed. Are they totally satisfied or would they do something different? You can ask for references from the store. However hardwood flooring is so popular these days that many of your friends will have had some experience with installing flooring. Ask for their opinion and references as well. We are all in hurry, especially once we have made the decision to go ahead with the purchase and the installation of the hardwood in our homes. If you know of an excellent installer, you may want to wait until he is available. Rather than go with another installer that you are not as confident with. Sometimes the wait is worth it to get the best installation that you can. The hardwood floor strips should run across the joists that support the floor. You can usually tell by looking at the direction of the joists in the basement to find out which direction they’re going. The hardwood strips should be placed across those joists on the upper floors. In addition there should be at least 5/8 inch plywood on the floors to provide maximum strength. This will avoid any squeaking or movement of the floor once the hardwood is installed. Some homeowners will also add additional nails or better yet wood screws to hold the plywood in place. This will prevent squeaking after the floor has been installed. The hardwood floor strips should run the length or the same direction of the hallway. This makes the room look larger and not as narrow. We have two hallways that intersect, so we chose the longer and wider hallway to run the hardwood planks the length of that hallway. In the other hallway which intersects with the first we had no choice but to run then across the width of the hallway. This makes it look a little smaller. But it is a short one and not used as much as the first one, so we are more than satisfied with this decision. In the living rooms or dining rooms or family rooms the same rule should apply. The hardwood strip should run the length of the room rather than the width of the room. Installing the hardwood floor strips in this manner should also usually comply with the earlier suggestion, The hardwood floor strips be installed across the joists in the basement or in the second floor. Once your hardwood floor is installed, many people will place area rugs to enhance the décor. In addition this will protect the flooring in high traffic areas. This is a great way to add accents to the room as well as complement your furniture. It brings everything together from a color perspective. Some consumers will also hire decorators to help them with this step to make sure that everything is color coordinated and looks great. Planning a new hardwood floor is part figuring out which type of hardwood to install. Then what color to install in your home and then who to install the floor! Most people spend a lot of time on the type of hardwood and the color. They want the end result to look really nice of course. Also to create the right look and atmosphere in their home and match it with their existing furniture. For most consumers this is the tough part. They give little consideration to the actual installation. They assume that the installer knows his business and will do a good job completing the installation. Sometimes the store were you purchase the hardwood will recommend an installer that they like to deal with. This is probably your best choice. Since he is associated with the store . You can take advantage of this relationship if there is any kind of problem with the installation itself. Consumers may want to learn more about the installation so that they can save themselves some money. In addition also ensure that they are totally happy with the installation when it is completed. For example the biggest complaint that many people have after their floor is installed is about squeaks the floor makes when you walk across it. As the floor dries out the floor will move a little bit and gaps sometimes form. When a person walks across the floor, the wood will move and make that squeaking noise that can be irritating to some. There are methods consumers can use to minimize the squeaks. You can never reduce or eliminate all of the squeaking. But you can certainly reduce the amount of squeaking if you take appropriate steps. Make sure that the sub floor is strong enough to support the wood floor that is being installed. Also that the sub floor is securely nailed to the joists below. For example your sub floor should be at least 5/8 inches in thickness to support the hardwood floor. It also should hold the nails that will be used to nail the wood floor to it. Assuming that the thickness is sufficient, consumers should make sure that the sub floor is nailed to the joists securely. Place a nail every 12 inches to make sure there is no opportunity for the sub floor to move. Many people will screw nail the floor as well. Place a screw nail beside every nail. If your sub floor is not sufficient thickness, you may have to add additional sub floor. Screw nail or nail it to the existing sub floor. Adding an additional sub floor layer and then the hardwood floor on top of that adds additional height to the floor. Which can be a problem when matching to other floors in other rooms. Consumers should take this into account when they are making their decisions. Discuss these requirements with the hardwood flooring stores. There are products that can be purchased that will bridge between floors . They will gradually slope from one floor to the other to provide a more gradual interface. Instead of an abrupt step from one floor to another. Discuss this issue and others with your flooring provider before you arrange for hardwood flooring installation. Also before the installer begins his installation, discuss how he plans to lay the floor out. A key decision is for the grain of the wood or the planks of the wood to be lain across the joists in the floor rather than in the same direction of the joists. You may have to confirm by looking in the basement to see which direction they are running. Also the boards should run the length of the hall rather than across a hall. This makes the room look larger when viewed from the beginning or entry point into the hall. All of the above items that were discussed are easy to control and implement. It can make a huge difference in your long-term enjoyment of your new hardwood floor. For more information about installing hardwood floors, click here. Hardwood floor installation is actually pretty straight forward. Once you have properly planned out what you are doing and made all of the decisions regarding what kind of flooring, it can be easy. What should you do about the sub floor and who should complete the installation for you? There are lots of sites that discuss the actual installation work of installing a hardwood floor. However in this post we are going to focus more on the practical side of all of the decisions that need to be made. When you consider a hardwood floor and hopefully provide a few guidelines or ideas for you to consider. Will you install hardwood flooring in the entire house, on one level, in one room? What about the stairs. Some people prefer to have several rooms carpeted and the rest with hardwood flooring to provide contrast. Some people want the entire house flooring to be hardwood. There are practical considerations to take into account in making these decisions in addition to the cost. Matching floor levels from room to room may be a concern if you want to avoid uneven floor interfaces. The stairs can be the most expensive part of the flooring due to the additional labor required especially if it is curved. More information on both areas in a moment. Obviously the existing floor material needs to be removed. The sub floor underneath needs to be cleaned of all debris and any nails or staples also removed to leave a smooth surface to work with. It is also a good idea to run over the floor with a vacuum to clear away any dirt and dust that may be left. This will mean less dirt will be stirred up when you are installing the new flooring. Use a broom to dislodge any dust that is sticking to the sub floor. If your existing sub floor is less than 5/8’s inches or you want to make sure that your floor is really tight with no squeaks. If not you may want to add another sub floor and screw nail it down into the joists. Alternately you can also screw nail your existing floor wherever there are existing squeaks. Test this by walking all over the floor and screw nailing into a joist at that point. Most installers will recommend that you install the floor with the grain of the wood running lengthwise in the room instead of across the room. This approach has the impact of making a room look larger than it actually is. Once you have chosen which way the wood grain will run, maintain this approach throughout the house. This is an entirely personal choice that will be made by you the customer. Something to consider is obviously matching the décor of the rest of the house and matching your planned decorating ideas. Also if you plan to sell the home anytime soon, you may want to choose something more neutral in color so that the floor will appeal to more potential buyers when it comes time to sell your home. Most people will usually go with the installer recommended by the store where you purchased your flooring from. Many consumers will do it themselves in an effort to save money as well. Like any project that you take on, take the time to learn how to do the installation properly and plan it out so that no mistakes are made. Once the floor is nailed to the subfloor it is pretty hard to take it up to do any rearrangements or make corrections. Once hardwood floors are installed they look fantastic. However the decision process leading up to their installation can be difficult for many consumers. There are so many decisions to make. They include color, quality level, to installer to flooring support. Don’t forget edging that will match or merge with other floor coverings in the home. Some consumers can find this a daunting process. Many will turn to home decorators that will assist consumers in their selection process. In some cases floor covering stores will have decorators on staff. Consumers need to be aware that not all sales people have this knowledge and experience. However they will imply that they have a great deal of experience, and tell you what they think you want to hear in an effort to get your business. These were not written in any order of priority, however we suggest that help from an interior designer would be appropriate, since there are many decisions concerning color and furniture design that can enhance the flooring or actually take away from the overall look of the room. We suggest that prior to selecting the flooring that wall color and furniture choices should be at least planned to ensure overall satisfaction with the choices. Consumers can save money by removing the existing flooring and arranging for disposal. Once the old flooring is removed, vacuum the floor and remove any staples and smooth rough areas to provide a level floor for the installer. This is the time to test your floor for squeaks. Consumers can either screw nail the existing sub floor to the joists in locations were the floor is squeaking or install added sub flooring to act as an additional stabilizer for the floor. Some people feel that a squeaky hardwood floor adds to the character of a home. Other consumers cannot stand the sound of a squeaky floor, so pay attention to this step if this bothers you. The installers will install the sub floor and they will install the hardwood floor for you. Once this is completed the next step is to install the corner round around the perimeter of the floor and paint it whatever color you select. We suggest that the corner round should be painted prior to installation since it is much easier to paint a long strip of wood that is not attached to another surface of a different color. Nail holes and any other marks can be repaired once it is installed. We also suggest that if you do plan to paint the walls that this work be completed before the new floor is installed. The painting can be done much more quickly. Especially when there is no need to worry about paint droplets on the floor. Once all of the painting is completed and the flooring installed, new window treatments can be installed. The furniture return to this room. Now you have a brand new floor that has been fully redecorated. It has a floor covering that will last for many years with proper care. Skilled hardwood floor installers can install a new floor in record time with high quality and make it look easy. They know how to get started and they know the mistakes to avoid. Installers also know that every piece of wood must be accurately placed. Each one must be secured before you go to the next piece. It is very hard work, especially on the back. You are kneeling or bending all of the time. 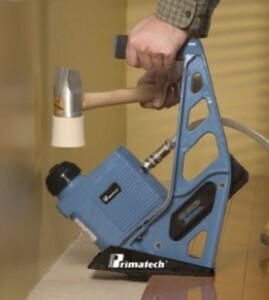 You are using a specialized nailer to knock the wood into place and nail it at the same time. Most hardwood stores and installers will tell you that the wood should be delivered a week ahead of time. It should be allowed to acclimatize to the home and the conditions in the home. This allows the wood to expand if needed. Also to also absorb humidity or dry out as the case may be. If your home is really dry or if humid, you may want to allow for more time. When you purchase your material from a store that specializes in hardwood and other floor coverings they will generally have their own installers to install floors or at least a list of installers that they have had good experience with. These installers generally will take work from a number of stores to keep busy unless the store is so successful that they work solely for one store. These are generally good installers to go with and you can count on the store to make sure that they have people they refer to that have good reputations. If you are still concerned, look them up on Google to see if there are any customer complaints that you should be aware of. People today do not hesitate to leave their comments about the stores they deal with or the hardwood installers that they have used. These comments can be invaluable to consumers who do not have a lot of experience dealing with installers. Another suggestion is to request references from the store you are dealing with. Of course they are going to provide you with customers they know are satisfied with the material and the workmanship. However by talking with these customers, you may learn some things to be aware of and to discuss with the store before you make a decision about purchasing and arranging for the floor to be installed. Many consumers will attempt to install the hardwood floor themselves in an effort to save money. This can be accomplished quite easily by most consumers. Provided that you take the time to learn how to install a floor and arrange to purchase or rent the proper tools. Regarding buying or renting, it really comes down to how long you will need to rent the tools and their cost to rent. Compare the price to purchase these tools and make a decision. Many consumers will purchase tools even if they will only be using them for this one job. They will then sell them later to recover some of their money. They come out ahead once they sell their tools to another person who is installing their own floors. Some flooring companies also offer courses on installing hardwood floors to their customers. This is offered as an incentive to persuade you to purchase all of the materials from them. Consumers should take advantage of these opportunities and learn the tricks of the trade. Often there are lots of things that can make your job a lot easier, save you time and frustration. Also review Youtube videos of which there are more and more available that cover most situations that consumers will encounter. We find that there is a great deal of information available to consumers that will enable them to take on most jobs. This is true as long as they take the time to educate themselves sufficiently. They can save a great deal of money by taking on these do it yourself jobs! Hardwood floor installation cost varies a great deal depending on the layout of your home. 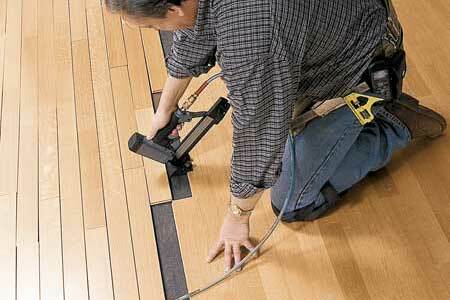 How much cutting etc needs to be done while installing your floor is also a factor. Installation is the next biggest cost that you will need to consider. Installing hardwood in a rectangular room of some kind, is relatively inexpensive. On the other hand if there are hallways or curved walls the amount of cutting and fitting is going to increase. The following are a couple of issues to consider when deciding to install hardwood flooring. The same thing applies to stairs when installing hardwood flooring on stair risers. Stairs that are straight with each riser being exactly the same can be cut and installed relatively easily. The challenge comes when you install risers on a stairway that is curved. Each riser is a different size and will also be an odd size. The riser must be custom made to fit the step. Then it must be fitted into the step to match all of the other. This takes extra time to measure, manufacture and cut to the exact width and depth of the stairway. Anyone who is planning to do their own installation may want to get help with a curved stairway. The measuring and cutting must be exact and you need to have the right tools to do this work. An experienced floor installer will be able to install the stairs faster. Select your floor installer with care. Confirm their experience before giving them the job of installing your hardwood floor on your stairs. Cutting and measuring is typically what takes all of the time when it comes to installing a hardwood floor. The choices you make in regards to which direction the flooring will run will play a big part in the labor cost. Let’s consider a hallway as an example. To begin you must coordinate the direction of the floor with other rooms in your home, especially if all rooms and hallways will be hardwood flooring. Typically most people will run the floor along the longest direction. This has the effect of making the room look a bit larger from an optical perspective while at the same time minimizing the amount of cutting that needs to be done. Adjacent hallways may have the floor run in the same direction or they may run perpendicular to the room that the hallway connects with. Consumers will never want hardwood flooring to run across the hallway. It should always run parallel to the hallways length to make the hallway look larger and to also enable full appreciation of the floor. This has the effect of significantly reducing the cutting and fitting required also. More cutting and fitting will take more time and increase your installation cost. In situations where two hallways run into each other in a ninety degree corner, a choice should be made to decide which hallway will have the floor run parallel to the longest length of the hallway and which one will have the flooring run across the shortest width of the hallway. We had exactly this situation on our own home and chose to run the floor parallel with the longest hallway which was also part of the main entrance to our home. This gives a nice long view of the hardwood floor and makes the hallway look larger than it is. The other hallway leads to the laundry room and the garage and is not nearly as important in terms of the way the home looks. It is also shorter and did not impact the installation cost of the hardwood floor significantly. You may have carpet in some rooms or tile or marble in entrance areas. Wherever the hardwood floor will meet these other flooring types and interface to this floor must be installed so that there is an easy transition from one floor to the other and the actual joint is seamless. These also take a little more time to install and require special materials to make them look perfect. Your hardwood floor provider can help you select these materials. Your installer will be able to install them with no problems. They do take a little more time and will add slightly to the cost of installing your hardwood floor. When you request an estimate for installation, you may want the installer to break down all of these costs so that you can assess what is being charged for each area. Then you can make an informed decision regarding whether you want to proceed or not with your hardwood floor installation. Most people will hire a professional to install their hardwood floors. It is just simpler and easier to have someone who does this for a living and will do it well to do the installation. Hardwood floors installation can be made easier and less costly. However there are some things you can do to lower the overall cost of the floor installation if you would really like to save some money. Saving money is always a good thing. You can use your savings for other things. Before we talk about what you can do to reduce the overall cost, we would like to spend a paragraph discussing your choice of flooring. Many new homes used to come with wall to wall carpeting and many still do, however the recent trend appears to be hardwood as the preferred choice. In fact a real estate agent friend of ours tells us that older homes will always sell more quickly if they have been updated with hardwood flooring. Carpeting is out and hardwood is in. It is not just hardwood flooring, but it must be clean and in good shape as well with the right stain etc. Stick to a relatively neutral choice in terms of stain. Anything that is dramatic or wild will only attract specific buyers. You could be limiting the potential buyers if you are trying to sell your home. Updating your home from wall to wall carpeting to a new hardwood floor is one of the best investments that you can make. Back to how you can save money when installing a new hardwood floor. Consumers can save the most money if they strike a good deal for the wood and install the floor themselves. However most people are not up to the job for a variety of reasons. So we will assume that you are going to hire someone to install your new hardwood floor. But there are things you can do to decrease the overall cost. Of course you can arrange for someone to do all of this work for you if you are not able or willing to do this work. There is usually lots of dust created when a new floor is being installed. So several of the steps include dealing with all of this dust and how to prevent it spreading to the rest of the home. There will be lots of dust while the floor is being installed so you may want to remove all window coverings and pictures etc. that are hanging on the windows and walls. If there are exposed nails or staples, either remove them or hammer them into the floor. If you plan to repaint the walls, now is the time to do it before the new floor is installed. Shut the furnace fan off if you have central heat. This decreases the amount of dust spread through out your home. You are ready for your new floor to be installed. 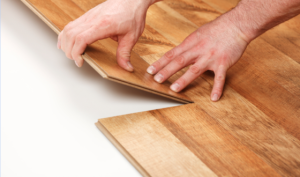 Most hardwood floor installers will be careful and try to limit the amount of dust they create from cutting boards. However there is still lots of dust created just from the nailing of the hardwood to the floor. This dust seems to come from every where. Everything you can do to limit it will help you from a clean up perspective later after the floor has been installed. Once the floor is installed and the new base boards are installed and painted a final cleaning of the room must be done to remove all traces of dust. Wipe the walls and windows with a damp cloth and vacuum everything. You can actually move the furniture back in immediately. However most people will want to wait until they have completely cleaned the room. Cleaners can be hired, however this is another expense that you can avoid if your are interested in reducing your overall costs. Good luck with your hardwood floor installation! The hardwood floor installer shown on the picture on the left is a power installer powered by an air compressor. This is the professional version of the installer. It is used by many hardwood floor installers to increase speed and decrease the labor required to install a floor. They work well, however most do it yourself weekend carpenters cannot afford to purchase this type of equipment. The installer is triggered by the operator hitting the trigger mechanism with a specialized hammer. This action will cause the floor installer to push the board tightly into the groove. It places a nail at the appropriate location as well to hold the wood floor to the floor underneath. An electric or gas air compressor is required. This equipment can be rented at a local equipment rental company if you are planning a weekend job for example or have only a small area to install. Professional installers will have their own machines which they will use on a daily basis. 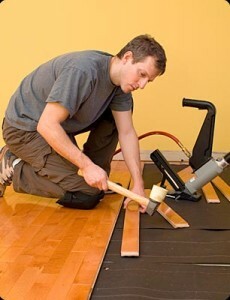 There are also mechanical hardwood floor installers which perform the same operation. However they must be hit slightly harder to trigger the nailing mechanism. A professional will usually have one of both. Preferring to use the air powered machine for most jobs with the manual installer for used in special situations or as a backup to his main installer. Can You Install Hardwood Floors Yourself? The answer is definitely yes. The previous post , “wood floor installation”, outlined the specific steps in detail for installing a hardwood floor by do it your self installers. The trick is to have all of the right tools available and to lay out your floor properly. Once you have that first row of boards laid down to your satisfaction, the rest is pretty straightforward. Review our previous post. Check out videos online that have been prepared by various hardwood floor materials companies. In our previous post we talked about installing a hardwood floor. In this post we will discuss in more detail the process of preparing the sub floor. The first step is to remove the existing flooring. Even if you are having your floor professionally installed, removing the old floor yourself can be a great way to reduce some of the cost of installing a new floor. Remove the carpet, the underlay or linoleum flooring that is currently in place. Disposal can be arranged with the floor installation company you are using or other local junk removal companies. Once the flooring is removed, you also need to clean the floor of any remaining debris and make sure that the floor is flat in all areas. Any protruding edges, staples or other material must be removed or hammered down into the floor. If there are squeaks in the sub floor, now is the time to screw nail down the sub floor to the underlying joists. You should also verify that you have sufficient sub floor to support the hardwood floor you will be installing. Check with your supplier for the specifications, however at least 5/8’s inch is usually required. If the sub floor is thinner than this, there will be insufficient support for the floor and it may develop squeaks over time. We often will also vacuum the floor to remove any dust and other particles of dirt that might have been on the floor. We even found cigarette buts from the time when the house was originally built. The original rug installers did not even take the time to clean the floor before they installed the initial carpet in out new home! this is also the time to paint the walls if you feel that your walls need a new coat of paint. It is much easier to paint when you do not need to be concerned about spilling paint on the floor. The installer will lay the floor and usually install the new baseboards as well. The base boards will be primed, however they will require another coat of paint. You should make sure that they also fill all nail holes in the base boards and the flooring before they leave. You will need to paint the baseboards with a final coat of paint. Give them a wipe first to remove any dust accumulation before painting. Once the paint on the baseboards is dry, you will need to wipe down all of the walls and the floor. A lot of dust is usually stirred up during installation. It will come to rest on your walls and floors. All of this can be wiped up with a damp cloth. Avoid getting any water puddles on the floor to avoid water damage. Once all of the cleaning is done, you are ready to move your furniture into the room. What is the hardwood floor installation cost? Doing a hardwood floor installation estimate must take into account a lot of items. The final hardwood floor installation cost really depends on the agreement that you strike with the installation company and how much work you are willing to do yourself. Our last post discussed all of the components and now we will talk about those items you can easily do yourself to minimize the hardwood floor installation cost and save you hundreds and sometimes thousands of dollars depending on the size of the job. Most people do not want to lay the floor themselves since they are concerned that they may make a mess of it, however there are lots you can do which will contribute to reducing the overall cost of the hardwood floor installation. Various hardware stores that sell hardwood flooring also offer training courses as enticements to make your purchase from them. if you would prefer to lay your own floor to further control the cost, then taking one of these courses is an excellent idea. All of these items can be done by do it your self consumers, however if you are concerned about laying the hardwood floor, then why not try to do the other things to reduce some of the installation cost. 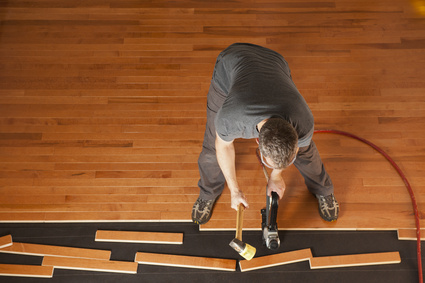 Preparing your Space for a New hardwood Floor: This one is pretty easy to do for most people. Move all of the furniture out of the room and remove the existing carpet and flooring. Nail down the existing plywood if there are any loose areas and remove any staples or other material that might make the floor uneven. Installing a Sub floor (if needed): That is the easy part. Laying a new sub floor to strengthen the main floor can also be completed by almost any consumer. However you will need some tools for this work. Lay the 4 by 8 sheets across the joists and nail them into the joists. You will need to cut the sheets of plywood to fit in the corners and at the end of the walls. Installing the Baseboards: The new baseboards can also be easily installed by do it your selfers. However you will need to have proper tools to cut and nail the baseboard on the wall. Also caulking compound will help to deal with any imperfections, nail holes and joints that do not fit properly. 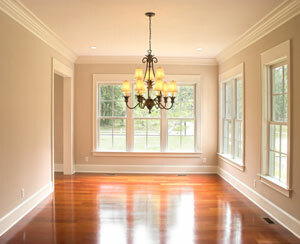 Clean Up: Cleaning up is not that hard to do and will reduce your hardwood floor installation cost a lot. Remove all small pieces of wood that cannot be used. Sweep up all sawdust and give the room that has the new hardwood floor a thorough cleaning. It is amazing just how much dust is created. It gets on everything when a hardwood floor is being laid. The total hardwood floor installation cost can be reduced to the cost of the material and the labor cost to install the floor. This saves a great deal of money for the consumer. As long as you are prepared to do a bit of work, the cost of hardwood floors can be quite reasonable. The installers really do not like to do these other jobs as well. So if you are willing to pitch in and help they will appreciate it. Comments are welcome about the cost to install hardwood floors, especially if you have the experience and knowledge. Hardwood flooring is increasing in popularity. It is one of the most durable choices compared to carpeting. With current prices, hardwood flooring is very competitive compared to wall to wall carpeting which has really become passe. Hardwood Floor Installation is easy with a few basic carpentry skills. Installing a hardwood floor is a relatively easy do-it-yourself project, however stairs can be more challenging, even for the best carpenters. Many people will opt for carpet on the stairs to avoid additional expense and concerns about slipping on the hardwood flooring on the stairs. A prefinished hardwood floor has a better finish and there is less work involved installing a hardwood floor. Select the hardwood species and the board widths for the room you will be working in. Measure the width and length of the room and calculate the square footage. Allow 10-15 percent extra for irregular boards and any cutting mistakes. The sub-floor minimum requirements are a 3/4″ plywood sub-floor. Eliminate squeaks by screwing a long drywall screw into the sub-floor and joist where the squeak occurs. Remove all molding from the room and vacuum and clean thoroughly. Roll out strips of vapor barrier paper, allowing at least a 4″ overlap and staple securely to the sub-floor. We used a 15 pound tar paper or felt. In climates were there is a basement, the vapor barrier is usually not required. Begin the installation at the longest unobstructed wall. Remove the shoe molding and snap a chalk line 3/8″ out from the baseboard to allow for expansion in the hot, humid weather and contraction in the colder, drier weather of the hardwood flooring. Begin by selecting a long board to start the first row. Pick one that is straight. Align the edge of the board with the chalk line and drill pilot holes down through the hardwood plank and into the sub-floor and joist. Face-nail each board at the point of every joist and set the nail with a nail-set. Face-nail the entire first row and remember to keep the board lengths random. It is important to face-nail the first row because you can’t get the pneumatic nail down in there, it will hit the wall and the force would push the wood against the baseboard and you would lose your 3/8″ expansion and contraction. It is important the lay the first boards perpendicular to the joist which are underneath. That is important because you want to get a nice solid anchor. You can look at the sub floor to see which way the nails and seams run. You might be able to go underneath your crawl space or into your basement to see how they run. After the first few rows have been installed, drill pilot holes down into the tongue of each board and hand-nail the rolls until there is enough clearance for the pneumatic nail gun. Add varnish or verathane to protect the wood and give it a finished look. This was a great deal of work and there was dust from sanding everywhere in the home. Today, in fact prefinished hardwood floors are by far the majority of flooring that is installed. There is still dust created from cutting the pieces to fit and from nailing onto the existing floor. However the dust is much reduced compared to sanding a hardwood floor. 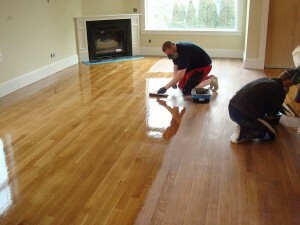 Most installers who are refinishing hardwood floors will now use dustless sanders. Whether you install the prefinished hardwood floor yourself or have a professional install it, you can start in the morning and have your furniture in place in the evening. That’s how quickly and efficient the flooring is for consumers who want to install hardwood flooring. Add corner round to the walls to finished it off and paint the corner round to match your walls or furniture and you have a new floor that will last for many years. If you are doing the installation yourself, chances are that you will be slower than a professional, so it may take a few days to finished the job. You will also have to purchase or rent a few tools including a hardwood floor nailer which makes the job much easier. Another major advantage of prefinished hardwood floors is that there are multiple colors and stains that can be purchased. Choose something that matches your decor that will last the test of time with regard to interior design fashion and furniture selection. In addition, consumers can be confident of a consistent color or stain across their entire prefinished hardwood floor, however be sure to select your wood from the same dye lot when you make your purchase and also purchase sufficient wood for the entire job. Different dye lots can have slightly different colors and stains. The hardwood also comes in a variety of sizes as well as types of wood. Chose narrow planks or wider planks depending on the design you are trying to create. Although prefinished hardwood floor material can be purchased and installed ready to use quickly, there is one area that many people may not realize that they need to be prepared for. Installing prefinshed hardwood flooring in a new a house is not a problem. All dust, shavings etc will be cleaned up before you move in. Unfortunately if you are installing flooring into an existing home, all of the dust from the time your home was constructed and also while you have been living in your home will be stirred up and find its way into everything. Even if you remove the carpet, sweep , vacuum several times there still seems to be a lot of dust that gets disturbed and lands on everything. Be prepared for a major dusting after you are finished. Consumers should remove as much as possible before hand. No matter how much you vacuum, there still will be dust clouds as the floor is being laid. Still, in the end, you will love your prefinished hardwood floor. When it is finished and the house is back to normal most consumers feel it was worth it! We have had hardwood flooring in our home now for 10 years. It still looks as good as new and we could never go back to carpet! For more information on Hardwood floor installation, click here. Timeless beauty, clean lines, strength and durability as well as the ease of cleaning and the classic look make hardwood flooring the perfect choice for your home. Home buyers are looking for hardwood floors as a first choice these days. You will add a lot of value to the home by installing hardwood floors especially if you plan to sell. Here are a few hardwood floor selection tips. Before you head off to the renovation stores, measure the rooms that you plan to cover with hardwood flooring. If you decide to also place hardwood on the stairs, measure these as well. Stairs are generally more expensive than flooring due to the extra cutting and shaping that is required. This is especially true of stairs that are curved which require a great deal more custom work to prepare the risers. You will be wise to match the room with your choice of flooring, whether hardwood or otherwise. Many people place hardwood flooring in kitchens, only to regret it due to damage from dropped dishes, moisture from spilled items and generally increased traffic. Also for example, do not try to put hardwood flooring in a bathroom, due to the high levels of moisture a bathroom receives. Different areas of the house demand different types of wood. For example, wood floors that have very light or very dark finishes typically do not fare well in the kitchen. If you want a bright home, dark wood will not accomplish this for you. It may give your home a more rich look, however it will be darker than you may prefer. Choose a hardwood flooring that has an appropriate finish to match your lifestyle. A sitting room that is seldom used will let you get away with a lighter finish. However a hallway or living room will get continual traffic and requires a choice that offers a tougher finish that can stand up to a lot of wear and tear. Once you make a choice you may also want to carry this forward into the rest of the home. Consider installation – doing it yourself or having a professional installer do it for you? Many people successfully install their own flooring, but only after they have done their homework. Many renovation stores will offer installation courses for those about to install hardwood flooring. It is often easier to hire a professional, but do you due diligence when selecting a hardwood flooring installer. You will want to be sure that it will be installed correctly. Choosing the color and style of the floor can be the fun part. Choose a hardwood that fits your personal taste and your lifestyle. The comparatively high cost of the flooring and installation demands choosing a wood that will not go out of style quickly. This last point is very important. Selecting a current fad can be detrimental to your home’s value and make it difficult to sell. Select color and style of hardwood flooring that will appeal to a wide audience of potential home buyers and colors that are easier to match with furniture. These are five basic tips that may help many people when they are embarking on the selection of flooring. Once you have hardwood you will wonder why you ever considered carpet in the first place! Comments are welcome. Spam will be auto deleted.